Jaxon/Ava - Best of friends (for now-lol)! Let' s just say that Ava is not quite the same baby as Jaxon. She is a little colicky in the evenings some nights... but she has thrush to so that could be it lately. But I invested in a sling called the Baby K'tan from target. It has 8 positions and can hold two babies at once. She can be screaming her head off and I put her in and silence! It's awesome, plus I can get things done around the house and play with Jaxon. Jaxon felt he needed in the picture too! Here's Ava enjoying the outdoors...she just looked so darn cute! Ava loved her first bath in her little pink tub (everything is PINK!! !...can you tell I first had a boy?) 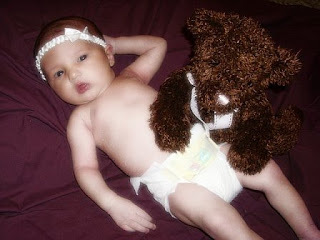 Her belly button clamp fell off at 12 days old...not soon enough, I hate changing diapers around those things! Jaxon's daddy has him in training to be a pitcher, hoping he will be a lefty. 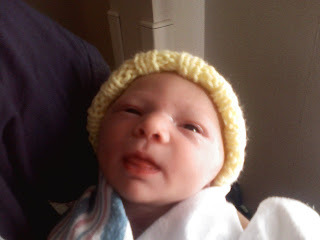 He also is hoping he will follow in his footsteps and be a redskins fan. He certainly likes his redskin pillows which he arranged himself in front of the tv to watch Barney. Check him out! I had training for my new job last week and I needed a sitter for the kids. Ang and Gracie came to stay with the kids. Jaxon had a great time playing with Grace. They watched Barney and played in the ball pit. He had fallen asleep and they left when I got home. When he woke up he cried for Grace. It was so cute! Jaxon and Ava went to the pediatrician on Monday...Jaxon (18 month check up) finally gained 1 1/2 lbs. since April and he was 30 3/4" tall, he now weighs 19.2 lbs. Ava on the other hand is growing well. She was 7 lb. 9 oz. at 11 days old and went from 18 3/4" to 19.5". Hopefully she doesn't pass her big brother. He may grow to resent that some day. Just wanted to post their stats. Jaxon loves to be outside so he plays on the back deck a lot. Yesterday...he had some visitors stop by. 2 random cows stopped along the fence to check him out. They would come right up to him and he would back away...he was a little afraid if they got too close, but he kept yelling "Cow!" and "Moo!" Glad we had the camera to capture the event. Since Jaxon loves playing the drums so much, we have been on the lookout for a miniature drum set for months. It was started to look like we weren't going to find one until closer to Christmas...but good old Nanny Reed was driving by a yard sale and spotted one...guess how much? $2.00!!!!!. He loves it. Since I am new to the little girl clothes, I have thoroughly enjoyed dressing up my baby girl...I'm not partial or anything, but I think she is beautiful! Jaxon absolutely adores his little sister. He is going to be the best big brother! He always wants to hold and kiss her, pick her up, give her the pacifier, sleep with her blanket, etc... We love watching him interact with her. 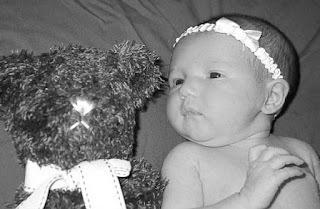 Ava Jane Smith arrived into this world on Thursday July 31, 2008 at 3:18 a.m. She weighed 6 lb. 15.4 oz. and was 18 3/4" long. She is doing wonderfully! 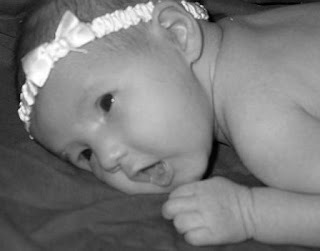 Enjoy some of her birth photos! Here is her birth photo next to her big borther's. They look very similar but he had more hair!